Fischer projection, 1891 is a projection created by Hermann Emil Fischer. This projection is used for molecules that are organic in nature and are three dimensional. It is basically, a two dimensional view of such molecules through projection. This type of projection is widely used all over by chemists in the area of biochemistry and organic chemistry. Carbohydrates are mainly the centre of projection that is useful for chemists. Since D Glucose is composed of carbon, the projection shows carbon chain in a diagram. Fischer projection primarily comes in use to identify the L and D glucose molecules. Through this projection, one can identify the D glucose molecules by taking a look at the positions of hydroxide and hydrogen that are placed on the right and left side of the chain. In L sugar, the placement of hydrogen and hydroxide is altered. 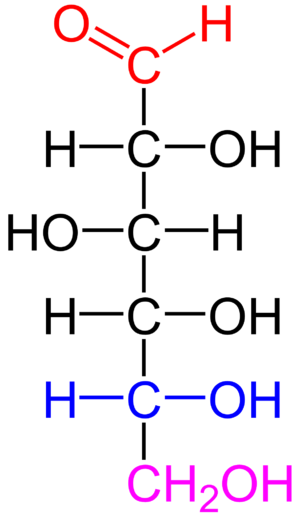 As seen in the Fischer projection, D glucose which is an aldohexose has 4 chiral carbons. It is the configuration of the chiral carbon that is placed at the bottom of the carbon chain which is used to recognize the D glucose molecule. This chiral carbon configuration can only be seen in a Fischer projection. Fischer projection is also used to generate Haworth Projections. Three methods are used to generate this projection. In a Fischer projection, the carbon chain can be seen only by a 180 degree rotation. When the projection is rotated to 90 degrees or 270 degrees, it leads in the inversion of stereochemistry. On holding one group of the projection, the remaining groups, without any hindrance, can be moved both ways- anticlockwise and clockwise.